1Department of Pharmacognosy, College of pharmacy, CairoUniversity, Cairo, EGYPT. 2Department of Pharmacognosy, College of pharmacy, AL Zawia University, LIBYA. Background: From the bioactivity stand point Artemisia monosperma Del. is reputed to have antispasmodic and anthelmintic properties. Various types of secondary metabolites were reported in A. monosperma plants from different localities. Objective: The current study was planned aiming to investigate the influence of stage of development on the composition, antimicrobial, antiinflammatory and antioxidant activities of the essential oil derived from the aerial parts of the Libyan plants. Material and Methods: A. monosperma volatiles were hydro-distilled from aerial parts of Libyan plants, collected at different stages of growth: before flowering (A1), and at beginning (A2) and by the end (A3) of flowering stage. Yields ranged from 0.16-0.26 ml/100g fresh material (A3, highest). GC/FID and GC/MS analyses were performed. Results: Among 16-20 identified components (97.63-99.00% of total composition), 11 were common in all samples. A1 and A2 showed close amounts of hydrocarbons (63.56 and 66.55%), but lesser than A3 (88.36%); monoterpenoids were mainly represented by sabinene (13.15-22.85%), β-pinene (9.00-24.03%) and β-cis-ocimene (3.73-12.92%); while sesquiterpenoids appeared absent. 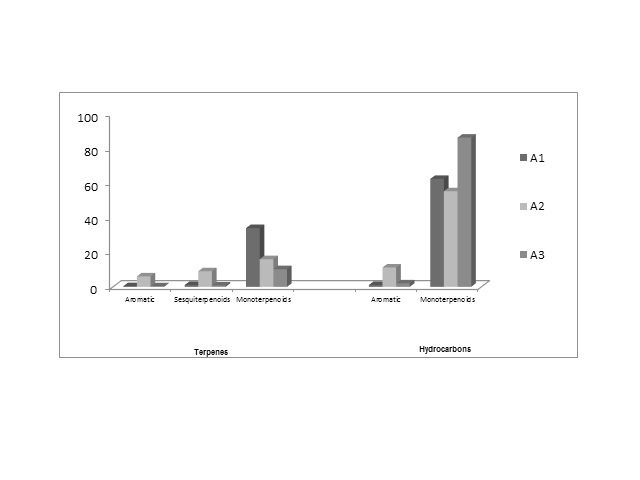 Among oxygenated components (11.29, 31.08 and 35.44 % in A3, A2 and A1), bornyl acetate was the major monoterpenoid (8.00-31.00%, highest in A1); and the sesquiterpenoid, β-eudesmol (8.01%) was detected in A2 only. Moreover, A2 demonstrated significant antifungal effect against Aspergillus fumigatus and Geotricum candidum (MIC 0.98 and 0.24 μg/ml). Conclusion: A3 exerted the highest anti-inflammatory activity as compared to the other volatiles. A1 restored the reduced blood GHS level in diabetic animals almost as efficiently as Vitamin E. The antioxidant activity of the volatiles is decreased during the flowering stage, being the highest before flowering (A1); this could be associated to the decreasing bornyl acetate content of the samples. Keywords:Anti-oxidant, Antiinflammatory, Antimicrobial, Artemisia monosperma, Essential oil composition, GC-MS, Libya. Zalabani SM, Tadros SH, Sayed AM, Daboub AA, Sleem AA. Chemical Profile and Biological Activities of Essential oil of Aerial parts of Artemisia monosperma Del. Growing in Libya. Pharmacognosy Journal. 2017;9(4):578-586.